First of all, when we feed the fish, we’re showing that we “take care of” other living things, and being taken care of is something very important to children. They know they need grown-ups to provide them with food, like the fish in our tank need us to feed them. It does have a lot to do with responsibility, as you mentioned! Also, I like to watch anything that swims! As for Katie’s request? 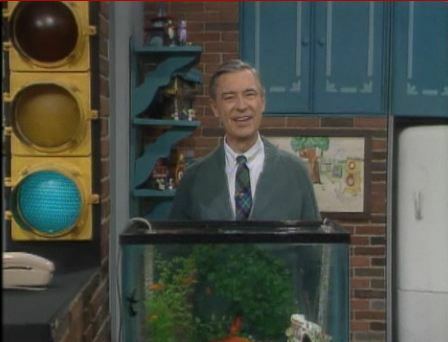 In the book, Mr. Rogers tells readers that, since receiving the note, he’s “tried to remember to mention out loud those times that I’m feeding the fish. Over the years, I’ve learned so much from children and their families. I like to think that we’ve all grown together.” What else would we expect from a man for whom every day was a beautiful day in the neighborhood? Bonus fact: Mr. Rogers once stated in an interview that all of his trademark sweaters were knitted by his mother. From the Archives: The Weight of Love: Mr. Rogers weighed 143 pounds. Here’s why. Related: “Dear Mr. Rogers, Does It Ever Rain in Your Neighborhood? : Letters to Mr. Rogers,” five stars on seven reviews, but only because you can’t give it six stars.